With the autumn season around the corner, we can use as many fall season wardrobe inspirations as we can get. There are trends to be followed and ensembles to be worked out. And it is always a good idea to look to our Bollywood celebrities for some style goals. And turns out, we didn’t have to look far. We have been seeing a lot of Kajol off late, what with promotional events for Helicopter Eela going on in full swing. 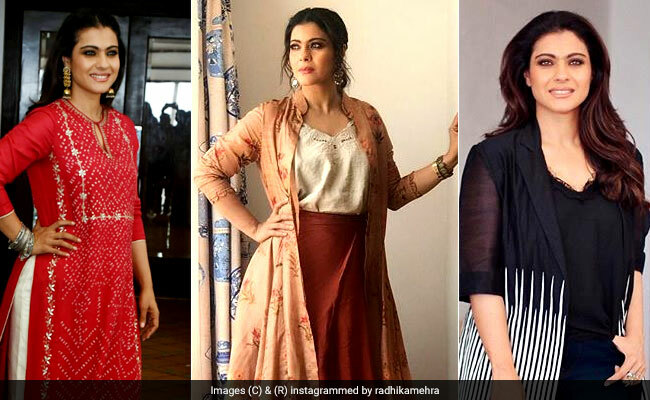 Each time, Kajol is rocking some trend or the other; from couture dresses to floral sarees to quirky prints, Kajol has been carrying them off like a true fashionista. And now she is showing us how to welcome autumn in style. Today, at a promotional event for Helicopter Eela, Kajol wore a beautiful Anoli Shah ensemble. The outfit consisted of a peach floral print long jacket, a white top, and a brown lower. In case you guys were wondering how to rock florals this fall, look no further. Everything from the colour, the print, and the texture of the outfit screamed autumn to us. She paired the look with statement earrings from Hyperbole Accessories. Jackets are a huge part of autumn and winter outfits. Kajol clearly knows that. Yesterday, she wore a black tribal applique long jacket by IKAI by Ragini Ahuja for Clove over her black top and blue denims. Talk about layering down right. Oh, and if you are looking for some festive season style inspirations, Kajol has some in that department as well. Check her out in this red and white Anita Dongre outfit. The gold thread work on the red kurta was all that was needed to bring a festive vibe to the outfit. Paired with Purab Paschim jhumkasand a pair of golden heels by Aprajita Toor, the outfit would totally work for a Diwali party or even a small wedding function.